Image caption Does this ancient jar hold the key to the provenance of Shiraz? An ancient clay jar has pride of place at the University of Pennsylvania museum in Philadelphia in the US. It was one of six discovered by a team of American archaeologists at a site in the Zagros mountains in northern Iran in 1968. The jars date back to the Neolithic period more than 7,000 years ago, and provide the first scientific proof of the ancient nature of Iranian wine production. Chemical analysis on one of them revealed that a dark stain at the bottom was actually wine residue. "This is the oldest chemically-identified wine jar in the world," says Prof Patrick McGovern. The first evidence of grape cultivation in Shiraz came around 2,500 BC, when vines were brought down from the mountains to the plains of south-west Iran, the professor says. By the 14th Century, Shiraz wine was immortalised in the poetry of Hafez, whose tomb in the city is still venerated today. "Last night, the wise tavern master deciphered the enigma," he wrote. "Gazing at the lines traced in the cup of wine, he unravelled our awaiting fate." In the 1680s, a French diamond merchant, Jean Chardin, travelled to Persia to the court of Shah Abbas. He attended elaborate banquets and recorded the first European account of what Shiraz wine actually tasted like. "It was a very specific red," says French historian and Chardin expert Francis Richards. "It was a wine with good conservation because generally the local wines very quickly turned to vinegar." But is there a connection between the "dark red wine that smells like musk" immortalised by Hafez, and the Shiraz wine drunk across the world today? Image caption Napa Valley vintner Darioush Khaledi emphasises Shiraz's "Persian heritage"
The first stop in my research is one of France's most famous vineyards in the Rhone valley in the south and home to the Syrah vine. According to local legend, the Hermitage vineyard was founded by a 13th Century knight called Gaspard de Sterimberg, who brought back a Persian vine from the Crusades. The names Syrah and Shiraz are often used interchangeably. Could Syrah be a corruption of Shiraz and prove a Persian connection? The definitive answer came in 1998 when DNA testing was carried out on the local vines to pinpoint their origin. "Some people think it comes from Persians and others from Sicily where you have Syracuse city," says grape geneticist Jose Vouillamoz. "But today we know all of that is wrong. "Testing was done by two different labs," he continues. "And it was really a surprise to find out that Syrah is a natural spontaneous crossing between two local vines from this area." So wherever the name came from, it seems there is no genetic connection between Syrah grapes and the wines of ancient Shiraz. But the trail does not end there. Outside of France, the biggest producer of Syrah in the world is Australia and the wine is always called Shiraz. This can be traced back to a Scot called James Busby who exported Syrah vines from the Hermitage to Australia in the 19th Century. His first consignment of vines was labelled "scyras" which many thought was a misspelling of Syrah. But when I re-read his journal, I came across a line which proved he knew about the Hermitage Persian vine legend. "According to the tradition of the neighbourhood," he wrote. "The plant - scyras - was originally brought from Shiraz in Persia." 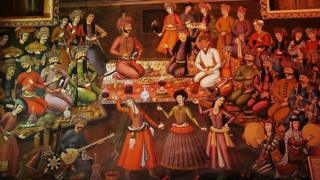 At that time European wine-makers sometimes imported wine from Persia to add sweetness and body. So perhaps Busby hoped the ancient name Shiraz would add some Persian mystique and flavour to his New World wine-making endeavour. The United States imported Syrah vines in the 1970s and the wine is always marketed under the Syrah name - with one notable exception. Darioush Khaledi, a son of Shiraz, is the proud owner of a 120-acre vineyard in California's Napa Valley producing what he insists on calling Shiraz wine. "My French friends say Shiraz/Syrah comes from the Rhone and [has] a 500-year-old history," he says. "But if you open an atlas of the world there's only one place in the whole world called Shiraz and it has a 7,000-year-old history of wine growing." He highlights his Iranian heritage in the vineyard. The entrance to the main building is lined with Persian-style columns reminiscent of the ancient city of Persepolis. The day we visit, his marketing manager Dan de Polo is holding a wine tasting for a group of Chinese buyers. "What's great about Shiraz is that it's always been a very soulful wine," he tells them. Soulfulness, spirit and poetry - words that come up time and again when talking about Shiraz wine. And for Darioush, and for me, I think that is what matters most. It is not about the DNA of the grapes, it is about the link Shiraz offers us to the spirit of our faraway homeland and the romance of its fabled wine.